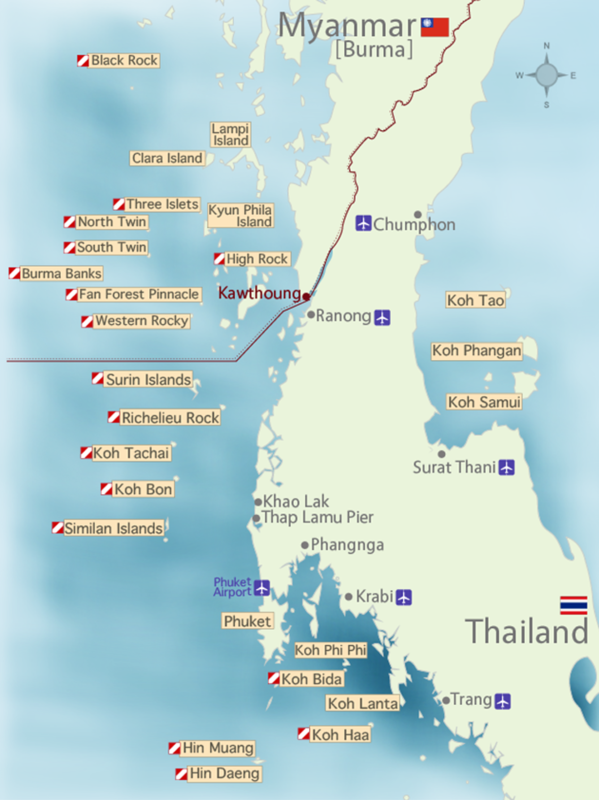 View our Burma Dive Sites Map to see where our Burma scuba diving liveaboard visits in Burma’s Mergui Archipelago. All itineraries are subject to change depending on weather and sea conditions. Black Rock is known for its sharks, black, white and silver tip to be precise. Mobula, manta and eagle rays also pop in and you might find a leopard shark or marble stingrays lazing in the sand too. Feather stars, sea fans with their hawk fish, anemones and multicoloured tube corals add colour to the reef. Keep your eyes open for eels and snakes and don’t forget to check the blue for monster sized barracuda, rainbow runners and big eye trevally too. Currents do swirl here and can be downward too, stay in close to the pinnacle and keep it safe. Also known as Shark Cave, this formation does indeed have three rocks which rise from a depth of 40m to close to the surface. You are also quite likely to see sharks, and yes there is a cave too. The nurse sharks here can get a bit curious if you remain still and quiet they might just approach to check you out. In the cave, you are likely to find lobsters, in the sand look out for eggshell shrimp and of course check under rocks for snoozing sharks and hiding stingrays. For the macro hunters, eyes on stalks for the ornate ghost pipe fish, frogfish, seahorses and harlequin shrimp too. As its name suggests, the site rises out of the ocean. The tiny island is home to one solitary tree seemingly perched precariously on top. This dive is a simple circular navigation of the island underwater portion. However, don’t let its simplicity lull you into thinking there’s nothing unexpected. There are enough huge swirls of snapper, glassfish, fusiller and yellow tailed barracuda to make your head swim. Watch out for the yellow seahorse, cool nudibranch and flatworm as well as porcelain crab and pineapple fish. High Rock is reported to have some of the highest numbers of scorpion fish, so keep your hands to yourself and watch where you are swimming. Having said that though, do carefully check out the crevices for lobsters. If you are lucky, you might see a snoozing nurse shark! North Twin is sometimes visited by big pelagics like eagle and manta rays, but it’s more common to spot turtles here. The southern end has a pinnacle that starts just three meters below the surface dropping to 35m. The site is made up of purple coral covered large granite boulders which have formed some great swim throughs. Parrot fish, angel fish and surgeon fish add to the colour. It’s quite common to find leopard sharks lazing in the sand and seahorse and pipefish in the fans. South Twin is a calmer site with little current and mostly great visibility making it suitable for all levels and night diving too. The site has some interesting gully formations along with overhangs and swim throughs making for a varied experience. It’s a great place to spot the sky ribbon eels and there are some fantastically coloured anemones too. Check under boulders for resting white tip or nurse sharks. Emperor angelfish, parrot fish, sweetlips and fusiliers are also commonly seen here too. This is the spot most people think of when they talk about diving in this region. These six flat-topped seamounts rise to a depth of 15m, sinking to some 300m. Sharks are virtually a given here. Nurse sharks and grey reef sharks are the most commonly seen, but there is always an air of the unexpected here. Black coral and hard table coral, Porites coral with their Christmas Tree worms, offer a backdrop for the stalking sharks. Barracuda lurk here too and you can expect to see the usual reef suspects too. These are both remote and advanced sites where divers should expect the unexpected. This completely submerged pinnacle drops to around 45m deep and features limestone walls and granite boulders. Its name is derived from the massive, sea fans. Fans of up to 3m can be seen with the largest examples being found from 30m deep. Wide angle enthusiasts will love it. Don’t forget that hawk fish, feather stars, ghost pipefish though and shrimp all love to hang out in gorgonian fans, so maybe you might need your macro lens. As an open ocean pinnacle, pelagics like whale sharks, mantas and a whole manner of rays and other ocean goers could pop in. Expect octopus, cuttlefish, rainbow runner and schooling barracuda as well as bat fish and angelfish. This is one of those dives that will stick in your memory for years to come. Firstly 20m high huge cavern dwarfs you. This cavern features a window archway allowing sunlight to stream through in a very ecclesiastical way. The big draw, however, is the tunnel that runs right through the centre of the island from 17m to 24m in depth for a distance of 30m. Imagine a dive site forgotten by time and untouched by human influence that’s been allowed to prosper and run riot. For those 30m you can easily get a glimpse of what life under the oceans waves was like in Jacques Cousteau’s time. Not only is the tunnel stuffed but it overflows at each end making it somewhat difficult sometimes to see your way forward due to the amount of fish blocking your vision. The Surin Islands are lovely and diverse and home to creatures and marine life not easily spotted elsewhere. Keep an eye out for the often confused Napolean Wrasse and bump head parrot fish. Turtles like to visit here too and barracuda intimidate the small fry. The colourful reefs ascend to the shallows and tumbled down boulders offer refuge for the macro critters like ghost pipefish and mantis shrimp. Look in the sand for ribbon eels and in the staghorn coral which provides refuge for cardinal fish. You might see a shovel nose ray or white tip shark too. Richelieu Rock is an unforgettable experience. Most liveaboard companies offer at least two dives here as it’s utterly impossible to take all of its magnificence in otherwise. The riot of colour afforded by the seething mass of soft coral is like an assault on your sight. The fantastic activity of all the reefs inhabitants is dizzying.The pinnacle is horseshoe shaped and just breaks the surface at low tide. Eagle rays, manta rays and whale sharks are often seen cruising around, but you can forget to look to the blue due to the ridiculous site in front of you. Travelly and barracuda patrol for the unwary, seahorse, frogfish and ghost pipefish try to hide from photographers and your NDL and air consumption will whizz along sending you all too quickly to the surface. This is one truly exciting dive site that overawes everyone. Another favourite of the manta, this site is like a tumbled down game of Jenga played with granite blocks. Lots of nooks provide shelter for marine life and coral as found a hold all over. Snappers, groupers, fusiliers, angel and butterfly contribute to the swirl of colourful action. Gorgonian fans wave, trevally circle and stalk and bat fish apparently aimlessly cruise around with divers. Huge barracuda haunt just within view and then worryingly slip out of sight. Currents can be strong and a bit turbulent here but stay close in and the action will often just whirl around you. Koh Bon is another manta ray favourite. The dive site follows a ridge like reef where divers hang out for a glimpse of a manta ray. While waiting, check out the lion fish and see if you can spot a purple fire goby too. The peninsula like reef has both steep wall and outcrops as well as a lovely coral garden. At depth, divers will find huge sea sponges and larger fans. Keep your eyes open for octopus, snakes and cuttlefish. This craggy limestone tower juts high out of the water and descends some 30m into the depths. The reef is rich and colourful allowing plenty of hiding spots for the macro critters that this dive site is known for, look for octopus, cuttlefish, nudibranch and shrimp too. Don’t just keep your nose to the reef though as leopard sharks and turtles do like to hang out too. Moorish Idols snoot their way around and scorpion fish and lion fish add some camouflage excitement. Koh Haa is recognised by its circle of 5 craggy islands which both protect and form an idyllic lagoon. Visibility is usually stunning and there are both swim throughs and a chimney and a cave replete with stalactites and stalagmites for those that enjoy this underwater adventure. The reef is rich and the soft corals make for a lush canvas. A truly stunning place with many hidden treasures amongst a sense of calm and space. Expect octopus, harlequin shrimp, ghost pipefish and the Durban Hinge beak shrimp. These twin pinnacles are close by each other but usually explored as separate dives. In the season, they are the manta hangout locales on everyone’s list to visit. Whale sharks also favour these pinnacles for a cruise by too. Theses sites, if you are lucky, might just deliver you both on one dive. If neither of these ocean giants puts in an appearance, the sites are very impressive regardless. Both seamounts are rich with colour with abundant life swirling around and camouflaged critters a-plenty.